California Data Exchange (CDEC) website enhancements may require clients to reconfigure automated import processes. Several CDEC website enhancements are now live. A number of URLs that cilents use may be affected. Since the format of data returned by the CSV webservice changed, automated import processes may currently be broken. 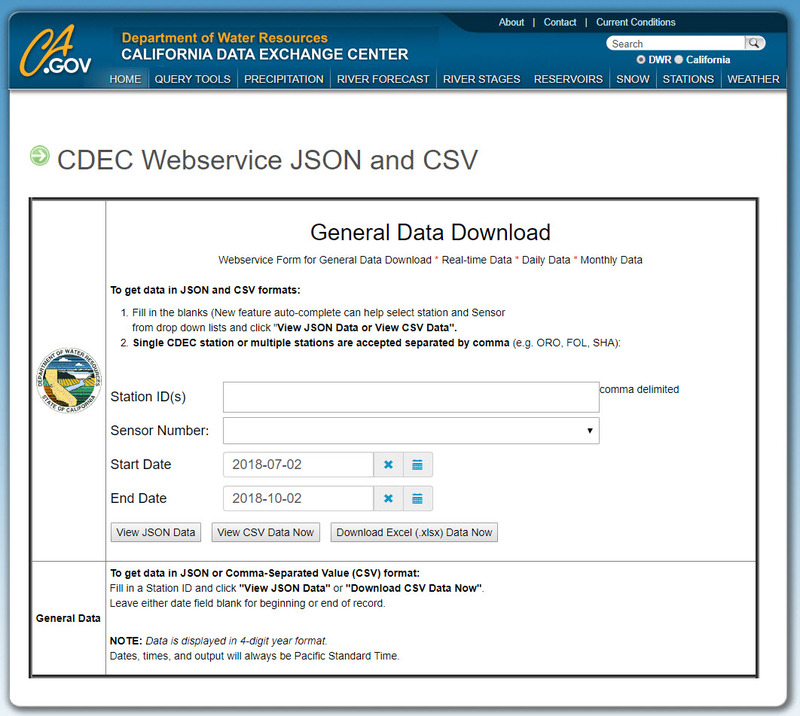 The new URL is cdec.water.ca.gov/dynamicapp/wsSensorData . Your existing configuration to automate data import may point to the old URL (http://cdec.water.ca.gov/cgi-progs/queryCSV) which redirects to the new URL. As of Oct 1, data web service of historical data for a single station or multiple stations now supports CSV and JSON formats. Hystra users note: The standard Hydstra CDEC importer (HYCREATE_CDECWEB) has been updated to use the JSON webservice. To import CDEC data, apply the latest v12 patch and make some minor updates to the HYCREATE_CDECWEB.INI configuration file. Operated by the California Department of Water Resources, the California Data Exchange Center (CDEC) installs, maintains, and operates an extensive hydrologic data collection network including automatic snow reporting gages for the Cooperative Snow Surveys Program and precipitation and river stage sensors for flood forecasting. Click for detailed updates to CDEC.